KILAUEA, Kauai — Mayor Bernard Carvalho works the crowd deftly, slowly moving from person to person, kissing, hugging and shaking hands. He’s at an event celebrating the third anniversary of Aina Ho’okupu, better known as the Kilauea Community Agriculture Park. Thirty years in the making, the park is cementing itself in the agricultural fabric of Kauai. And, as he does frequently, Carvalho has turned out to help make the event in a white rented tent in the middle of a field special. He takes a little more time than usual to chat with three young aspiring farmers — none seemingly older than 20. Out of the corner of his eye, he sees someone with a camera. Instantly, Carvalho puts his arms around the three guys and wheels them so they are in perfect position in front of the lens. Everyone beams radiantly. Kauai Mayor Bernard Carvalho, second from right, still never misses a photo opportunity, such as this one recently with three aspiring farmers at the third anniversary celebration for the Kilauea Community Agriculture Park. It is, after all, an election year, and Carvalho’s behavior is classic politician running. But that’s where the story gets interesting. 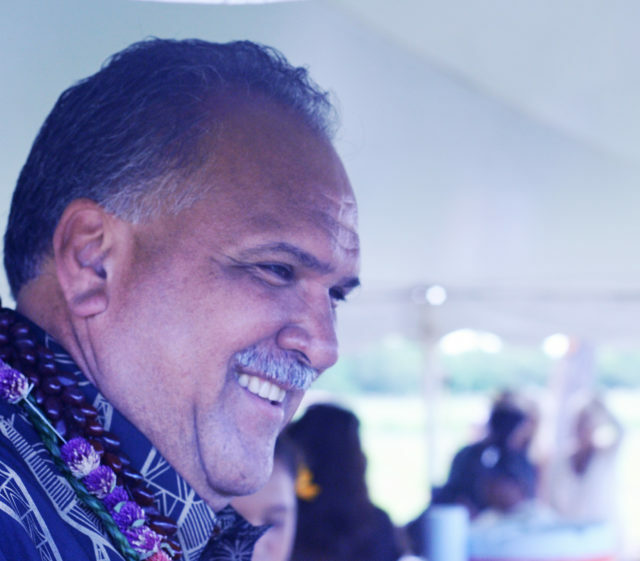 Carvalho spent more than three decades in the employ of Kauai County — 17 years as a line civil service worker, six years as department head for parks and recreation, then 10 years as mayor, after succeeding Bryan Baptiste, who died in office. Carvalho terms out in December. But this year was something of a political Waterloo for Carvalho. He ran for lieutenant governor in the Democratic primary — his first attempt at statewide office — and lost big to Josh Green. In fact, Carvalho finished third with 18.5 percent of the vote. Carvalho’s campaign theme was “Think Big,” and to know him is to understand that’s a play on words in a couple of different ways. For one, Carvalho is big. Big enough that he played pro football for the Miami Dolphins for two years. Watch Carvalho “run” in the annual Kauai Marathon and it’s easy to see that football left him with very dicey knees, but he turns out for the event doggedly, year after year. You’d never know he’s not a candidate for something, because Carvalho is still working the crowds. But even though he could retire now at age 57 and live comfortably from his decades of county pension eligibility, he doesn’t intend to do any such thing. He has three adult children, one of whom, 33-year-old Bronson Carvalho, currently resides at the mayor’s home with his wife, regrouping after returning to Kauai from the mainland. There are two grandchildren and a mother-in-law for whom Carvalho is a key caregiver. Sarah Blane, the county’s public information officer, volunteered that Carvalho often calls in to say he’ll be late getting into the mayor’s office because he has to drop off his grandchildren at school. So for Carvalho, the question of the hour is: What now? He has not taken his foot off his mayoral gas pedal. 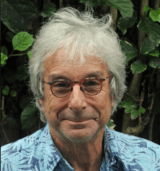 His priorities include two desperately needed housing developments, a multifaceted project to make the island more bike- and pedestrian-friendly and the revitalization of Lihue as the urban core of Kauai. 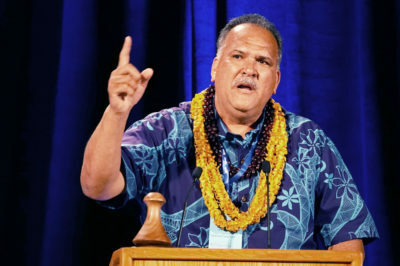 Carvalho speaks at the Democratic Party Convention in May on the Big Island. He says he never considered that he wouldn’t win the LG primary. He could have just walked away. That wouldn’t be Carvalho. “People are asking if I’d be interested in looking at different private sector positions, say in housing or tourism,” he said, emphasizing those opportunities are all with nonprofits. “Or maybe some government appointed position. What has happened (since the primary) is more opportunities are coming. I get to have a menu of options. He was, however, coy about which area of opportunity he favors. He insisted he had expected to win the lieutenant governor’s race. This attitude does not surprise people who know him even tangentially.